Preheat the oven to 350°F. Place a medium size bowl in the refrigerator to get cold. In another medium sized bowl, combine the graham cracker crumbs, sugar and melted butter. Press the mixture firmly on the bottom and up the sides of a 9-inch pie plate. Bake in the oven for 7 minutes, cool completely and set aside. In the cold medium bowl, whip the heavy cream with a hand mixer until stiff peaks form. In another bowl, stir together the chilled condensed milk and frozen lemonade. Gently fold the lemonade mixture into the whipped cream. Pour the filling into the crust and freeze overnight. About an hour before you are ready to serve the pie, in a medium bowl toss the berries with the sugar and lemon juice. Set aside until ready to serve. Let the pie come to room temperature for 10 minutes before cutting. 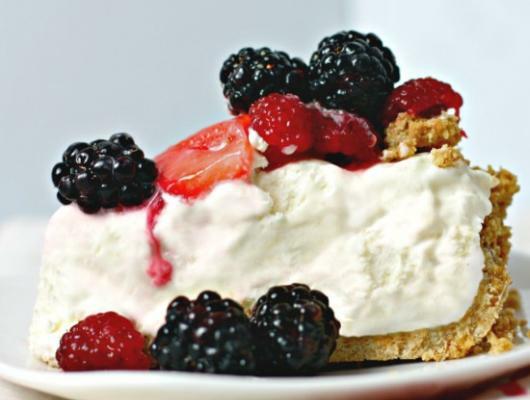 Top each slice with the berries and Enjoy! 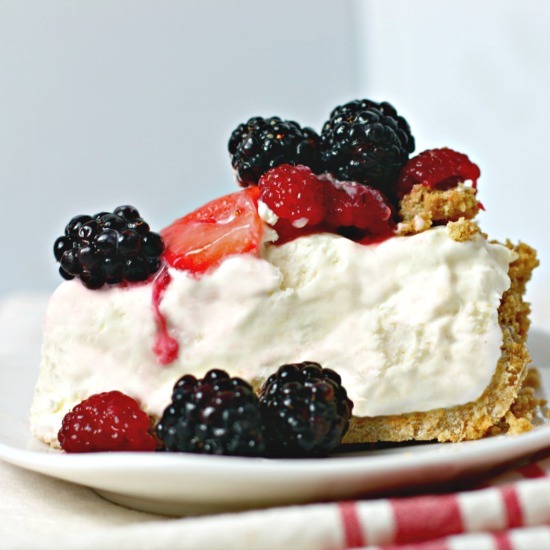 This decadent creamy Frozen Lemonade Pie with Berries is the perfect dessert for a refreshingly sweet and tart summertime treat!